Valiant Knight slot machine from WMS is a Super Multi-Pay game that makes it a very volatile, but potentially extremely rewarding, mobile slot. It has 5 reels, a huge 80 paylines and features a Valiant Knight in a medievakl theme. There is also a free spins bonus which rewards lucky punters with up to 10 free spins, but more importantly up to 12x multiplier which can create some big wins. 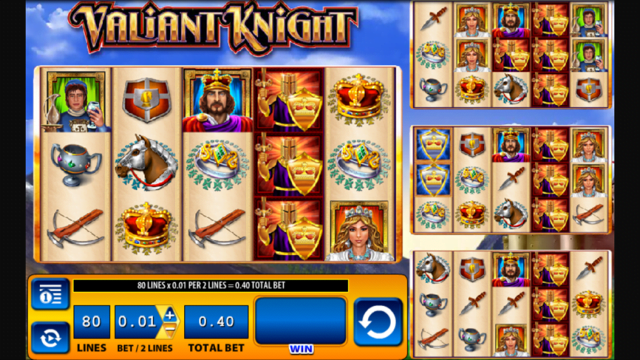 Check out all the details in the full Valiant Knight slot review below. If you like your wins big and your slots volatile, you’ll love getting to grips with WMS’ explosive title, the Valiant Knight slot – the third game from the studio to feature the highly intricate Super Multi-Pay system. Featuring five-reels, 80 paylines and a rather unique gameboard, the Valiant Knight slot machine is themed around medieval fantasy and boasts dashing knights, beautiful maidens and a range of armour and weaponry among its unique symbols. The game itself is played across four separate reel sets and the wild symbols carry over from the main board onto the other reels to provide further winning potential on each new spin. Playable from £0.40 per game, Valiant Knight is not quite as high variance as WMS’ famous Bruce Lee slot, but it should nevertheless come with a bit of a health warning. The game features a regular jackpot of 750x players’ total bet, but the really big wins come from the free spins bonus feature, which can award up to 20 additional games with a massive 12x multiplier if players are especially lucky. If you’re unfamiliar with other Super Multi-Way games, the way to trigger the bonus feature will initially sound a little complicated – but once you get into the swing of things, its benefits soon become clear. Essentially, whenever you land three feature symbols on a reel set, you’ll qualify for 10 free spins in the bonus round, with an increasingly valuable multiplier available for each combo you land. For three Valiant Knights on the main reel set, you’ll receive your 10 free games with a 3x multiplier. Land it on two reel sets, however, and that multiplier will increase to 6x. Should you be fortunate enough to land this combination on three boards, the multiplier will be 9x, while if you land the maximum possible outcome of four feature-triggering wins, you’ll benefit from a huge 12x multiplier. If you’ve managed to keep up with us so far, you’ll also be pleased to hear that there is one re-trigger available on free spins, with the multiplier being calculated in exactly the same way as the base game. Although a little daunting to look at initially, the Valiant Knight slot is actually a pretty straightforward game that allows players to chain together huge winning combinations at the cost of pretty high variance. Like the Valiant Knight slot review? Check out these as well…..